Uniformity of doctrine is an unfailing note of the Holy Orthodox Catholic Apostolic Church of the East. But with dogmatic unity once assured the Church has always been ready to adapt itself to the exigencies of national life among the peoples to whom its message has come. Thus the Syro-Arabian, Greek and Russian branches of the Orthodox Apostolic Church, while one in doctrine, are each independent, or rather autocephalous, in government, and the cultus varies in form and language according to the needs of the different groups within the pale of the Eastern Obedience. 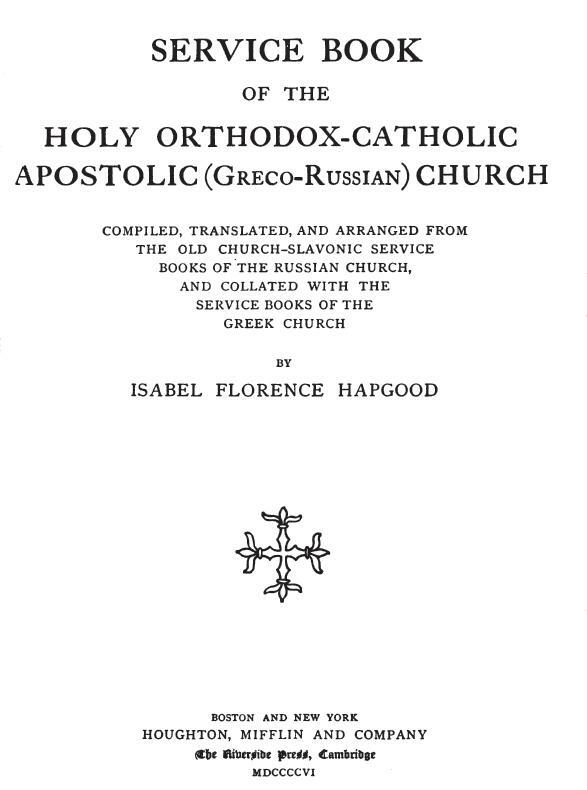 The Service Book compiled and translated by Miss Hapgood for use in public worship of the Russian Church in North America is a timely recognition of the presence in this country of an increasing number of adherents of the Eastern Church, and of the fact that English is the only language that communicants in America may hope to have in common. In her important project Miss Hapgood has had the backing of the Holy Synod of Russia, by whom part of the expense of publication is defrayed. Count Sergius I. Witte has been a liberal contributor, and dignitaries like the Archbishop of North America have given sympathetic scholarly aid. The old Church-Slavonic service books from which the translations have been made contain a wealth of liturgical material too bounteous for ordinary purposes. By following the canon of judicious neglect Miss Hapgood has succeeded admirably in making a book which shows all the services in general use. The list includes the liturgies of St. John Chrysostom and St. Basil the Great, the Liturgy of the Pre-sanctified Gifts, the Service of the Hours, the All-night Vigil and Grand Compline. Offices for the chief festivals are given, as well as orders of Ordination, Holy Baptism, Holy Unction and the lesser rites. The translator has added valuable chapters on the significance of the liturgical actions and on the symbolism of the Church, and has furnished complete tables of the lessons, feasts and fasts. When once through the wicket, however, the convert finds that the Orthodox Apostolic Church has ample pastures for the flock. As James Darmesteter said of Judaism, there is with the cult of isolation a creed of catholicity. Whoever turns to the treasury of devotion which Miss Hapgood’s pious initiative and diligence have made accessible will in the closer view of this venerable communion get fresh impressions of its length and breadth, a deepened reverence for its great names, a more sympathetic understanding of its intricate yet effective symbolism. A spirit breathes through the ancient forms a needfulness and awe characteristic of worship at its highest. Hapgood’s Service Book has been digitized and is available at both Google Books and the Internet Archive. The only real biographical work on Hapgood, so far as I’m aware, is Marina Ledkovsky’s 1998 article. And, to listen to my new podcast on Hapgood’s life, click here.